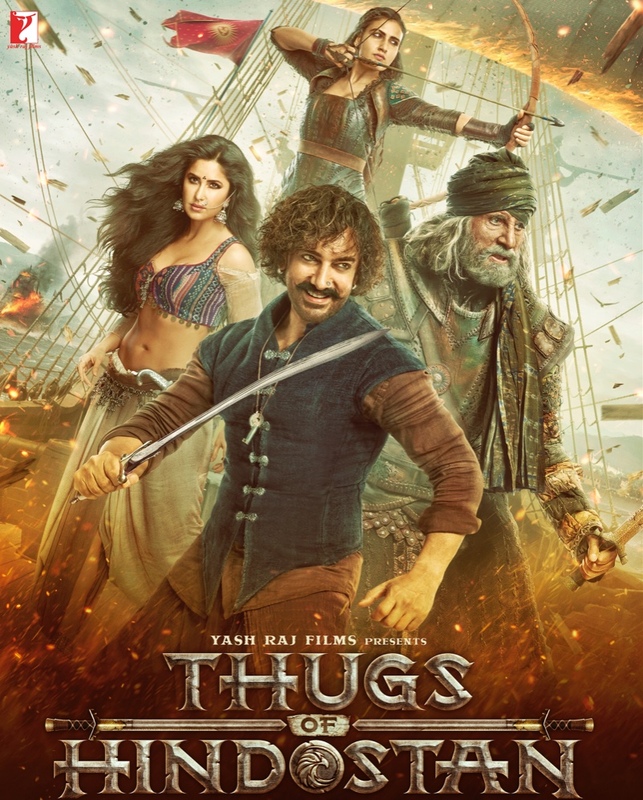 Imagine Pirates of the Caribbean meets Rang De Basanti and from the trailers you are some way to the new film that released this Diwali called Thugs of Hindostan. 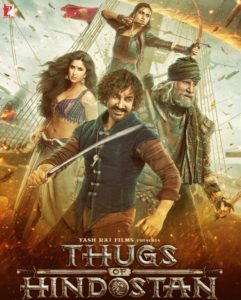 Starring for the first time together Amitabh Bachchan and Aamir Khan, along with Katrina Kaif and Fatima Sana Shaikh, this is high seas drama set during the Indian opposition to East India Company’s rule over India in the early 1800s. Directed by Krishna Acharya and backed by Yash Raj Films, this is an all-action blockbuster. For this reason, there are only a few songs to this album, all of which have been scored by Ajay-Atul, having already been successful this year with Dhadak. The opening song Suraiyya is obviously an intro song to Katrina Kaif’s character of the same name. Musically its mid-to-late 50s big band swing, but visually it’s courtesan from a Sanjay Leela Bhansali period piece. Visually, it’s set in an English Officers club with giant circular stage on which Suraiyya teases the crowd with Firangi (Aamir Khan) giving helpful attendance while musically the lyrics are all in Hindi, something that hasn’t been a trend this year. The singers are Vishal Dadlani and Shreya Ghosal and while each does everything an audience expects, the big drum that provides the beat throughout is joined by a tabla for Shreya’s bits and often the cacophony drowns out her voice. Either way though, the game is simple: the on-screen audience ask for Suraiyya’s hand and Suraiyaa says they don’t have the stones to be with her. The second song is Vashmalle. For those who are wondering what Vashmalle means, the Internet seems agreed that its all about getting loose and dancing free. This is obvious from the chorus line “Thirak, thirak, thirak, jhoom le, Vashmalle”. Still it is set on the boat at the centre of the story so the sailing folk feel is very important delivered by the beat and very few instruments. Once again tabla and dhol feature in a big way, with mandolin as support for singers Sukhwinder Singh and Vishal Dadlani. Not a song that’s going to leave you alone easily, however its very repetitive and really doesn’t do much to make itself interesting. The singers are good and back up some fun visuals between Amitabh and Aamir, but outside of this quirk, it’s just another song. Initially the last song of this album Manzoor-E-Khuda is a touching, sad, almost devotional song opening with low violins behind Sunidhi Chauhan’s impressively strong voice. Shreya Ghosal takes over as the background builds to include some big horns and an air of mystery. The rest of this song however is Amitabh reborn direct from the 70s and 80s. For those with long memories, think Shaan, Naseeb and Amar Akhbar Anthony especially songs like the iconic “Yama Yama”. This is obviously an action sequence with the violins and drums combining to keep the heart racing through the codas and bridges, while Sukhwinder keeps up the pace where he is required, but again there isn’t anything new going on here; the fans will know straight away. A short album is often used in action movies where a love angle isn’t really required and where the story and action take all the precedence. We have seen this work well this year with Raid and Pataakha. Nevertheless, this is a YRF film. This is the film of a movie house that has made music the centre of so much and maybe the aim is to go away from that past. By taking this short album, heavy action perspective Aditya Chopra and team are putting forward a new age of YRF films. If that is the case, then it’s certainly worked as the songs will while being a complete distraction from the story more likely simply disappear behind the action. Even with all the glamour on show in available teasers, there really is no buzz in these songs once listened to for the first time.